I am looking for difference between adiabatic expansion and Joule-Thomson effect. Looking at the setup demonstrating Joule-Thomson effect, I find no essential difference between the set-up for the two. What is the use of the throttle/ porous plug? If it is the throttle that makes the process isenthalpic, what is the physical reason behind it? I am not sure what it means. Does it mean that its temperature jumps abruptly from initial temperature to final temperature? It has only two temperature throughout the process? How is this possible? I expect the temperature to change continuously, because the volume of the gas changes throughout the process. 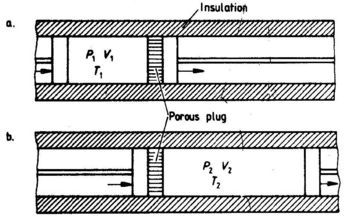 In the Joule-Thompson experiment, there is major viscous dissipation of mechanical energy (in this case pressure) to internal energy occurring within the pores of the plug. This is analogous to Poiseuille flow of a viscous fluid in a tube. If the tube is adiabatic, the fluid flowing through a tube experiences a temperature rise as a result of the viscous "heating." The work to push the fluid through the plug is totally dissipated and converted to increased internal energy of the gas. The reason that viscous effects are so important in flow through a plug is that the pores are very small. So flowing the gas through the plug is analogous to flowing the gas through an array of very tiny tubes in parallel. Ordinarily when a gas expands adiabatically, it cools. But, for flow of an ideal gas through a porous plug, the adiabatic cooling is exactly offset by the viscous heating. So there is no temperature change. And, as a result, there is no enthalpy change. Why does a real gas with attractive forces between particles experience an increase in internal energy when expanding isothermally? What is the maximum number of emission lines when the excited electron of a H atom in n = 6 drops to ground state?